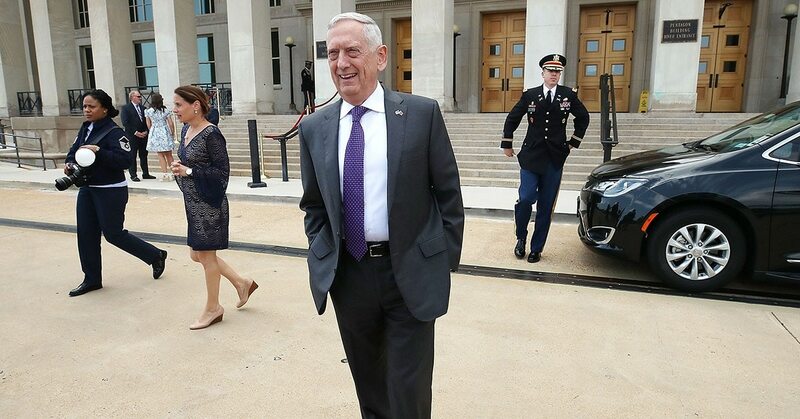 Secretary of Defense Jim Mattis acknowledged Aug. 7 that Russia made attempts to influence the 2016 election and outlined ― more or less ― how the Pentagon is helping states bolster their election cybersecurity efforts. The text below includes lightly edited excerpts of the official transcript from a press conference Mattis held at the Pentagon. Q: On the election security, you have spoken recently about the efforts of the Pentagon to provide support for election security for the midterms and beyond. As you have looked at this issue, can you offer any more specifics about what you think the Defense Department could do to help states and governments assist in election security with active measures that you’ve spoken about? SEC. MATTIS: The -- the question has to do with, you know, we all saw what happened in 2016 when the Russians and possibly others, but the Russians for certain, tried to do both influence operations and actually -- and actually get in and actually corrupt some of the election process. And so, what we’ve done is taken a look at all of those things so that we know what to look for. We are engaged in support of the Department of Homeland Security and law enforcement in order to maintain the integrity of the election. I prefer not to say what those specifics are because in that case, our adversary would know. And the adversaries may be more than just Russia. We are not focused solely on one country. We are focused on protecting the elections themselves. So we're looking at both this influence peddling and the corrupting -- the violating the integrity of the elections. And those activities are in direct support of law enforcement and Department of Homeland Security. Q: When you say the Russians, are you in fact talking about the Kremlin? Are you talking about Russian government ordered and support interference in 2016 and possibly beyond? And is there any credible evidence in your mind of anybody other than the Russians? So it is official Russian support? SEC. MATTIS: I believe it is official Russian support; however, that is not exclusive. There is also other activities that went on that perhaps are not directly ascribed to the official Russians. But we watch for all of it and we can trace at least parts of it back to -- to the Russian government. Q: Mr. Secretary, are you worried about any of those influence peddling campaigns targeting U.S. troops in particular? And how are you trying to keep officials for falling for any of that? SEC. MATTIS: You know, I -- the -- the U.S. troops, of course, U.S. -- the United States troops, they’re troops, like all Americans we have to be alert to the people who would try to manipulate an election in the Information Age when there’s so many feeds coming into everybody, and everybody has access to those. So U.S. troops are part of protecting the Constitution, protecting the integrity of the elections and protecting what we stand for. And certainly, we pay attention to that as well but it’s part of the larger -- the larger domain of protecting America. Q: ... Give us your sense of what you really mean when you say “and possibly others”? SEC. MATTIS: Our -- our mission is to protect the Constitution, protect our way of life, protect our elections, maintain the integrity of the election process, that is what we do in support of Department of Homeland Security and we protect against anyone who would try to muck around from outside the country. Q: But who did you see? SEC. MATTIS: ... From lone actors, from whomever. And it takes -- as you know, it’s very hard to identify in each case, but in some cases we have. I’d prefer not to go into more details on that. Q: And in the -- in the coming elections, are you certain you can see and hear the Russians if they come again? SEC. MATTIS: Yes, I’m not going to get into that. I’d prefer to leave quiet how we conduct those operations. You understand? SEC. MATTIS: I have -- I have all the authority I need. I’m not going to get into the specific authority. I’d prefer not to let any adversary know what we have up our sleeve. SEC. MATTIS: That, I’m not going to tell you. What else is on your minds? All right, so why don’t you guys get out and get some water in you, OK?